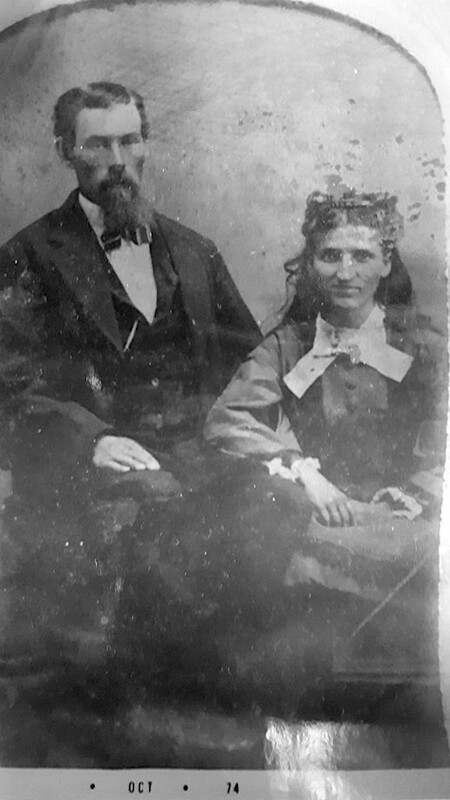 My great-grandparents were married in 1870. They farmed in west-central Illinois a mile from his brother. The brothers moved to Illinois from Ohio. Earlier, they moved to Ohio from Virginia during the Civil War. 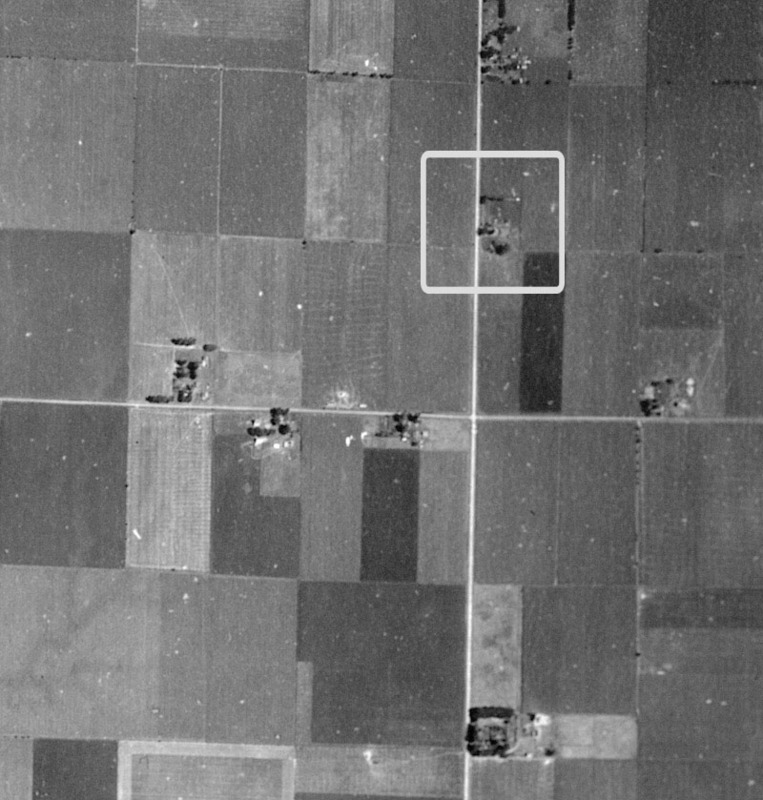 The rectangle in this 1941 aerial photo shows the location of the farmstead where my great-grandparents lived after they were married. 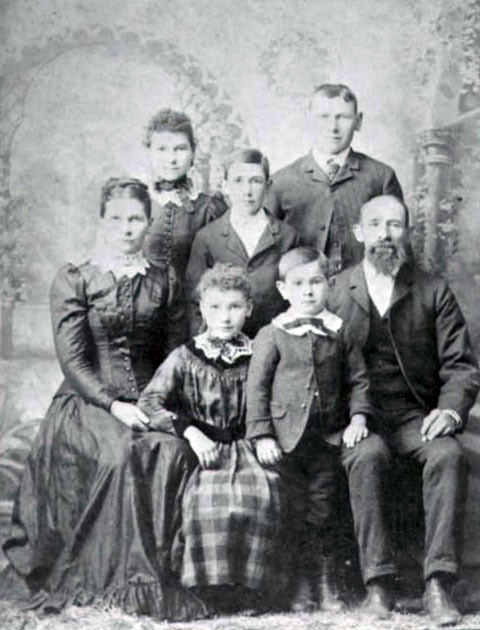 Here are my great-grandparents and their five children in about 1890. My grandfather is the one in the center back row. Here is my great-grandfather’s brother and his wife. They eventually had seven children. Notice a date of Oct 74 at the bottom. That is when a relative photographed the original photo from nearly 100 years before. UPDATE: InSight landed successfully on Mars on 26 Nov 2018. The microchip with my name and 2.4 million others is now resting on Mars attached to the spacecraft. 6 Nov 2017: My bags are packed. I am ready to join 2.4 million other passengers as we begin our journey to Mars in May 2018 aboard the INSIGHT spacecraft. The trip will take about 7 months. It is a one-way journey. Click to read the fine print. My flight miles award will be enormous. INSIGHT is the acronym for Interior Exploration using Seismic Investigations, Geodesy and Heat Transport. NASA loves acronyms. Previous Mars missions have studied intensively the surface and atmosphere of the planet. This spacecraft is the first designed to study the interior in hopes of finding clues to the formation of the rocky inner planets. The spacecraft will use seismology, heat flow equipment, and very precise tracking to probe the planet below ground. I love to see scientists celebrate success of their work. Today the InSight spacecraft made a safe landing on the surface of Mars. It was a tense 7 minutes. The video has been set to begin moments before touchdown. Watch and enjoy. The International Space Station approached from the northwest at 9 pm on 8 Aug 2018. It went high overhead in a southeasterly direction. 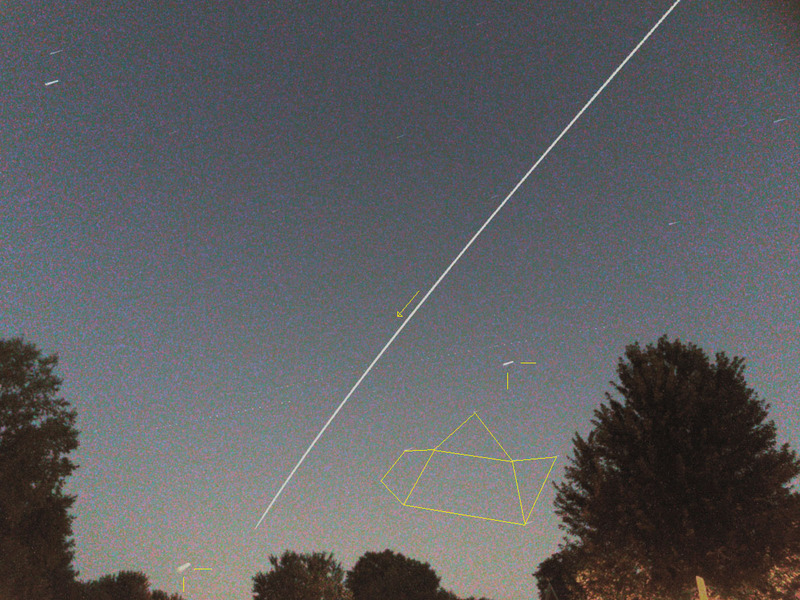 It tracked above Saturn and the Teapot in Sagittarius before disappearing near Mars. 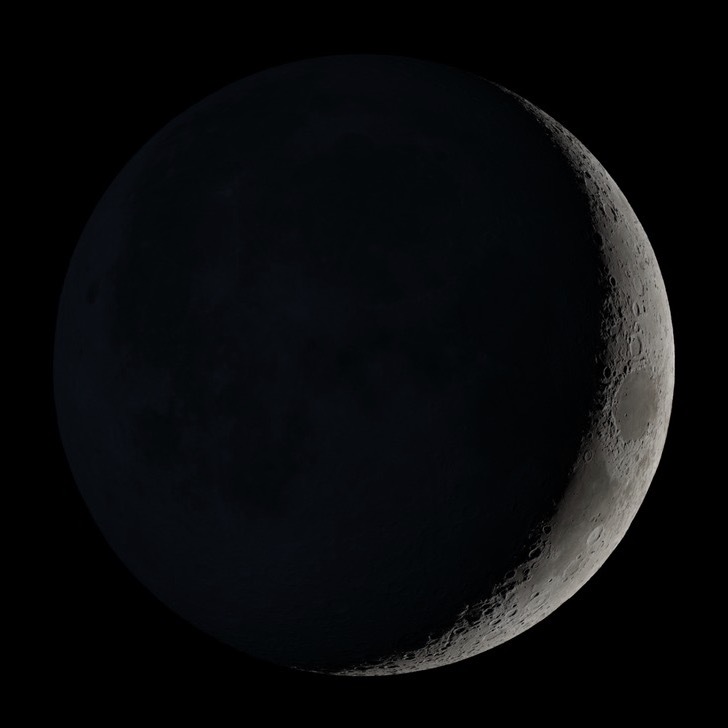 There it entered the darkness of Earth’s shadow. Here is the same image annotated. Can you also see the light trails left by two passing jets? Tap images for more detailed views. Discussion in a previous post centered on getting to space and into an orbit near Earth. 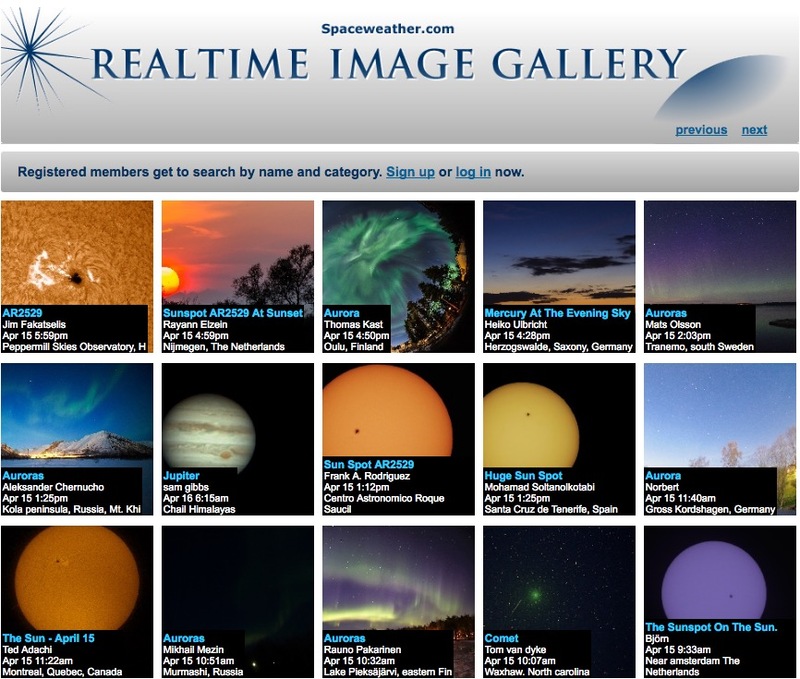 This post is about how spacecraft return from orbit. Some returns are under control and some are not. Launch to orbit requires giving a spacecraft a large amount of kinetic energy of motion (KE) and a large amount of gravitational energy (PE) due to its altitude. The large amount of work done to gain those energies comes from the potential energy released by an engine(s) as fuel burns. Once in orbit with engine(s) off, the total of those two energies (KE+PE) stays constant except for the small decrease due to the small atmospheric drag at high altitudes. If the orbit is a circle the two energy quantities are unchanging. If the orbit is an eccentric ellipse, the quantities do change but not their total. The next graphic shows an eccentric orbit of an Earth satellite. 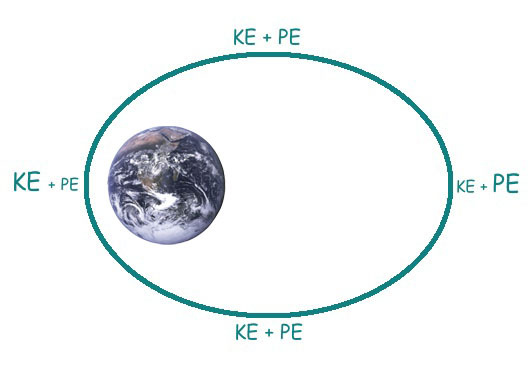 When it passes closest to Earth (perigee), the KE is at its maximum value and the PE is at its minimum. Font size was changed to illustrate their inequality. When at its farthest point in orbit (apogee), it is going slowest with minimum KE and is at its highest altitude with maximum PE.